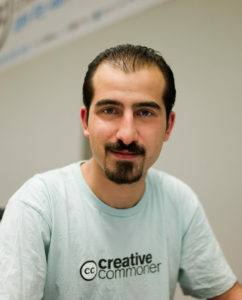 Bassel Khartabil Safadi was a Syrian developper. He was very invested in promoting and developping Free Softwares, and contributed (amongst a lot of other things) to Firefox and Wikipedia, because he believed, as we do, that free (as in freedom) softwares have something to do to improve our world. He was not particularly politicaly involved, but his voice, and his foreign connexions (he studied in Latvia, and attended some conferences in Lebanon, Poland, where he met other developpers, he invited Mitchell Baker and “Joi” Ito in Damas…) could not be accepted by the Syrian regime. This entry was posted in Duik and tagged Bassel, Duik. Bookmark the permalink.